He's the man behind the caretaker government in Bangladesh. The emergency was imposed on his directions. Was unknown even in his country. Keeps away from the limelight, is a devoted family man, loves to play golf. Became army chief in June 2005. Commissioned in 1975. Important assignments: Commanded infantry brigades, served with UN forces in Rwanda, was military advisor in the Bangladesh high commission in Islamabad. Did courses in Harvard University and the Centre for Security Studies, Hawaii. Seized luxury cars. They are to be auctioned for raising money to build a hospital for the poor. When Bangladesh president Iajuddin Ahmed declared a state of emergency and appointed Fakhruddin Ahmed to head the caretaker government in January, his seemingly precipitous actions kicked up a swirl of speculations. Was the military scripting the cataclysmic changes? Or was the upheaval even a prelude to direct army rule? Bangladeshis pondered over these questions, expressed their views in whispers. Weeks later, on February 8, that speculative swirl evanesced because of the speech Bangladesh army chief Lt Gen Moeen U. Ahmed delivered at the Bandarban cantonment in the southeastern hills. He confirmed the army's support to the caretaker government. But, he also added, "the army has no intention to take over. We are not even running the government. But we would like to see this government succeed as we want to put the country on the right track through concerted efforts of all". The general's speech was telecast on most TV channels, providing people a glimpse of the man whose hand now rocks the political cradle of Bangladesh, the swish of whose baton conducts the symphony of tunes emanating from the caretaker government—about eradicating corruption, introducing electoral reforms, punishing those who have looted public money or indulged in terrorism. The immense popular interest in the telecast was as much testimony to the power he wields as to the anonymity he has courted in the nearly two years he has spent as army chief. To this post he was appointed on June 15, 2005, by ex-premier Begum Khaleda Zia. In a delicious irony, reminiscent of the dethroning of Pakistan prime minister Nawaz Sharif by his appointee Gen Pervez Musharraf, Khaleda, to her horror, found Lt Gen Ahmed nixing her plans of conducting elections geared to favouring her party and sabotaging the chances of her rival, Sheikh Hasina. The general's taciturn nature was perhaps why politicians hadn't realised that his patience had run out with the two grand ladies whose perennial squabbles had pushed Bangladesh to the brink of a political precipice. Perhaps his intervention was prompted by his sense of history, witness as he had been to the political turmoil in the early years of Bangladesh's birth, a period that coincided with his graduating from the Bangladesh Military Academy. He passed out in 1975, the year in which Bangladesh saw its founder Sheikh Mujibur Rahman killed in a coup. Surely, there were non-violent methods of effecting a change: over three decades later, Lt Gen Ahmed showed how! Always rated as a bright officer, his prestigious assignments have included commanding two infantry brigades and heading the School of Infantry and Tactics. Earlier, he was among the young army officers handpicked for taking security-related courses in prestigious foreign universities. This saw him spend time at Harvard University, Boston, and the Centre for Security Studies in Hawaii, as well as doing a course in intelligence in London. He was felicitated with the "US Force's commendation" because of his contribution in Op Sea Angles that the United States conducted during the devastating cyclone of 1991. Apart from serving with the United Nations forces in Rwanda, Lt Gen Ahmed's other significant duty abroad was a stint as military advisor in the Bangladesh high commission in Islamabad. Beyond these biographical details, what is known about him is that his son studies in the US, his daughter is married, and that he loves to wield the golf club. For an insight into him, analysts have been poring through his speech delivered at Bandarban and another two in March and early April. Since then he has been content watching from the sidelines the caretaker government adhere to the broad framework set out. The contours of this framework have been defined by his deep disgust of politicians. "Our politicians do not understand anything beyond their self-interest," Lt Gen Ahmed declared at Bandarban. There he outlined plans to stamp out corruption. "We need a heavy crane to put the train back on the track—and the strength of the people is the crane," the general said metaphorically. He cited an example of the systemic rot—disputes over who should pocket the "10 per cent kickbacks" prevented the last government from implementing a $200 million machine-readable passport project. He wondered aloud about the source of wealth of those who cruise the streets of Dhaka in BMWs, Mercedes Benzes and Fords. "This is our farmers' money," he said. A fleet of luxury cars has been seized since then, earmarked for auction to raise money for a hospital for the poor. The general said, "The time has now come to stop the politicians capitalising on money. The nation needs a competent political leadership so that Bangladesh could achieve development and progress like Malaysia and Singapore." The drive against the entrenched venality in public affairs is being led by Maj Gen Masud Uddin Chowdhury, who is the chief of the National Coordination Committee on Combating Corruption and Crime and considered Lt Gen Ahmed's pillar of strength. 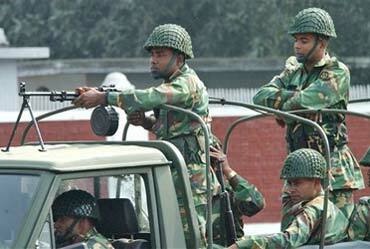 To journalists, Maj Gen Masud recently said about his hunt for the corrupt, "There's no consideration of who they are. Those who appeared untouchable once are already apprehended." This was a reference to the arrest of Khaleda's son, Tarique Rahman, and the recent verdict of a special court against her political secretary, Harris Chowdhury, for failing to submit his wealth statement. Their names figured on the list of 50 corrupt suspects that the committee made public for the Anti-Corruption Commission (ACC), headed by Lt Gen (retd) Hasan Mashhud Chowdhury, to examine. The ACC is now expected to press ahead with the second list of 50 corrupt suspects. Fighting the menace of corruption isn't the only thing that is consuming Lt Gen Ahmed's energy; he's as much concerned about employing history to unite a society fractured along political lines. In a speech to freedom fighters on March 27, the general said, "They (politicians) have even failed to give due recognition to the national leaders. Think about it, we haven't even given recognition to the father of the nation (Sheikh Mujibur Rahman)." His remark was a subtle condemnation of Khaleda's policy of rewriting history for effacing Mujib from textbooks. This prompted The Daily Star editor Mahfuz Anam to applaud the general and urge the caretaker government to "bury our murdered history forever and give our leaders their due place". Perhaps nothing was more telling politically than the keynote paper the general presented at a regional conference of the International Political Science Association on April 2. He said Bangladesh needed its own brand of democracy that recognised its own social, historical and cultural conditions with religion as one of the several components of its national identity. He defined "own brand of democracy" as a "balanced government" where power was not vested in one family or dynasty, a prescription which could consign Khaleda and Hasina into political oblivion longer than what they may presently envisage. Is it HUJI... or is it not?